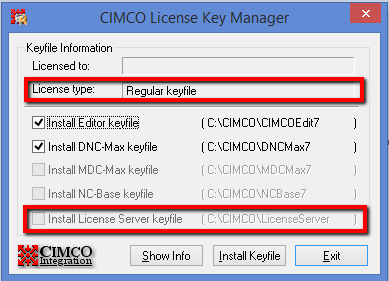 CIMCO products require a license key file to be able to run as a licensed version. There are two options to installing the license key file; connected and not connected to the internet. This document shows how to process for both. Once the software is installed, if you do not have a license key file, it will function as a 30 days timed evaluation version. This evaluation version has some technical limitations but will function for a period of 30 Days from when installed (once the evaluation version has been installed; uninstalling will not reset the 30 day limitation). Upon purchase a .key file will be emailed to you. There are two types of license key files; Temporary and Permanent. 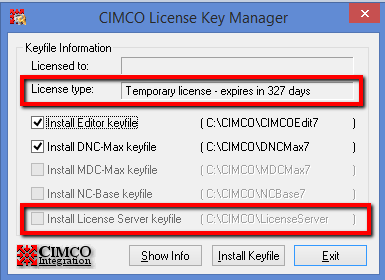 The temporary license key file is timed but allows the software to run as a licensed version (within the time limit) without requiring an Activation Key. 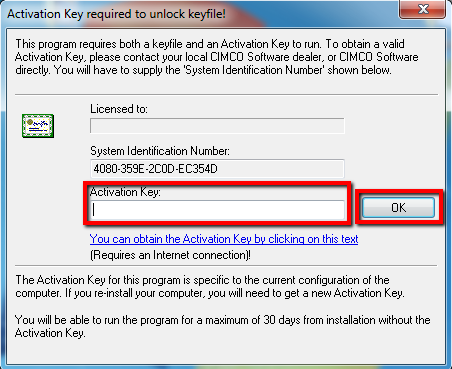 The Permanent license key file is not timed and requires an Activation Key. The activation function will only allow the activation of the number of installations purchased and ties the install to the hardware. Please ensure that the computer the software installed on is the computer you intend to use the software on before activating a permanent license key! For DNC-Max server software that is running as a service, the service will need to be stopped and the application DNC-Max server will need to be run as an application temporarily to allow for the activation process of a permanent license key. After the license is activated the DNC-Max application can be closed and the service can be restarted. What type of License file do I have? This is an example of a temporary license file for a standalone system. 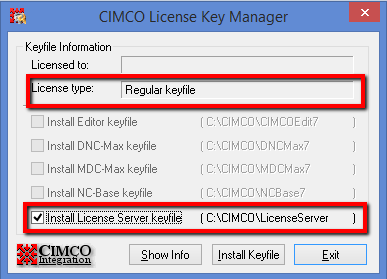 This means the license file needs to be installed directly on the system in which Cimco is installed. This is an example of a temporary license file for a server setup. This means the license file needs to be installed on the system that is your Cimco License Server. This is an example of a permanent license file for a standalone system. 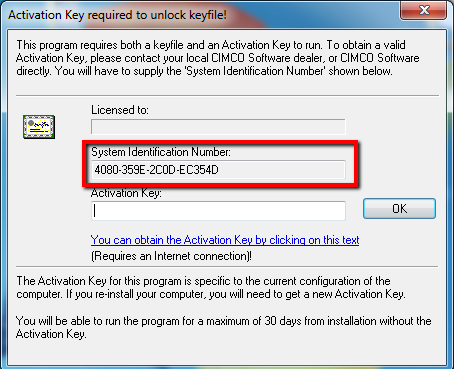 This means the license file needs to be installed directly on the system in which Cimco is installed. This is an example of a permanent license file for a server setup. 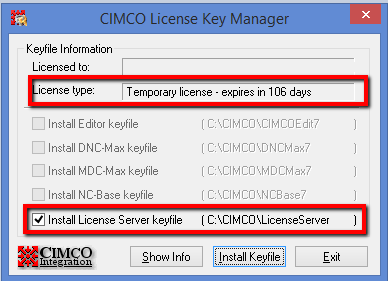 This means the license file needs to be installed on the system that is your Cimco License Server. 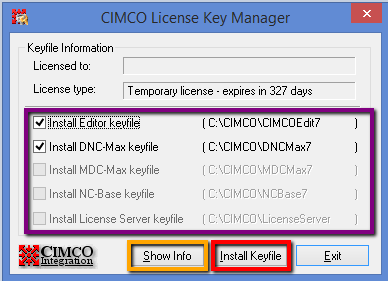 Once you have installed DNC-Max or CIMCO Edit, the installer will create an association of .key files to open with “KeyManager.exe”. Double click on your “license.key” file to launch the “License Key Manager.” Click on the “Show Info” button and it will show the products that you have purchased. To install the keyfile, check the product(s) on the check boxes then click on the “Install Keyfile” button. 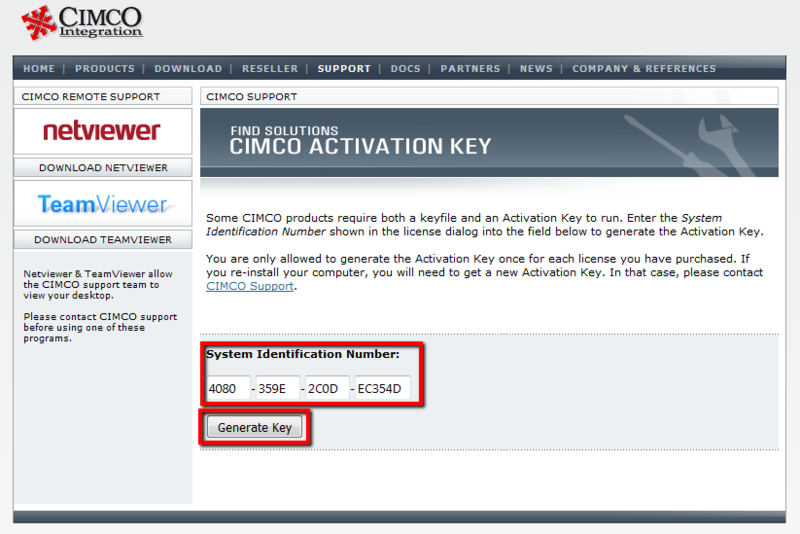 CIMCO Edit and DNC-Max each require its own Activation Key. The steps of getting both Activation Keys are the same. Note that the System Identification Number from your computer is already in the right place. 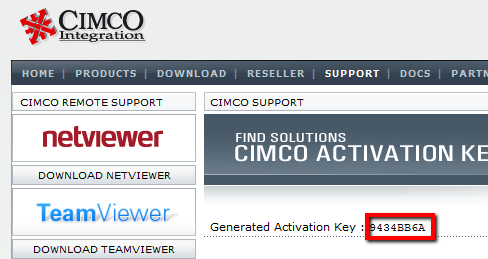 Click on “Get Activation Key” (If you get an error, please contact our support department. [email protected]). 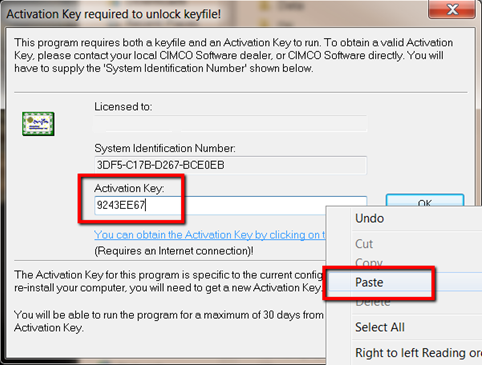 Go to the software Activation Key request window and paste (Ctrl + V or right mouse click) the Activation Key in the white space. Click the “OK” button and your software will be licensed. 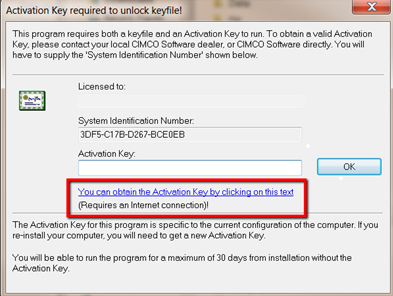 Go to a computer that has internet connection or call someone who has the internet access such as our support department and have them get the Activation Key for you by going through the following procedure. 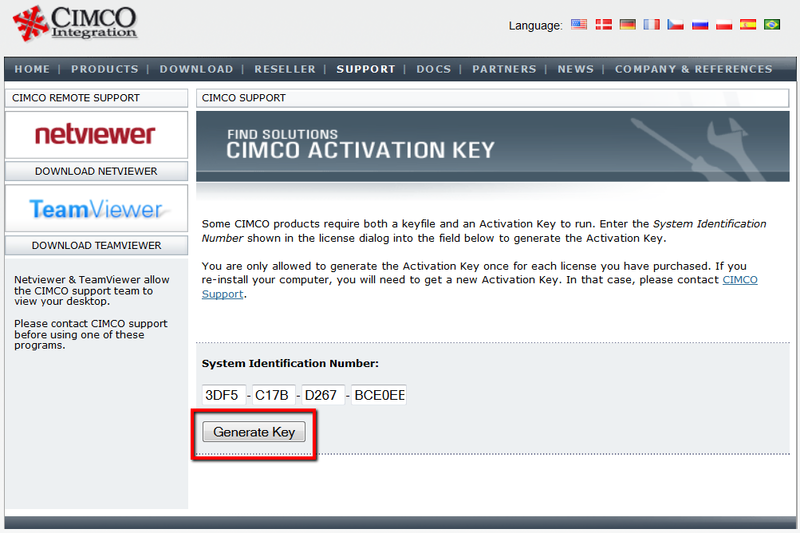 Go back to the computer in which Cimco is installed and enter the “Generated Activation Key” and click the “OK” button. If you are using a floating or network license and more than one license file is present on the network, the key file may not install correctly. The old key files need to be removed or the extension needs to be renamed to something other than key.